The vehicle was built by hand, each Lego piece was connected to the next without the aid of any glue, stressed the company. The team used 339 types of Lego Technic pieces, and some of them were put together with a special tool made out of Legos. The car has Lego doors, headlights, taillights, steering wheel, and brake pedal all working, but no acceleration pedal. The motor is made of Lego, and there is a functional speedometer made of Lego, too, and the vehicle even has a working active rear spoiler that pops up on the back end of the car, just like the real one. 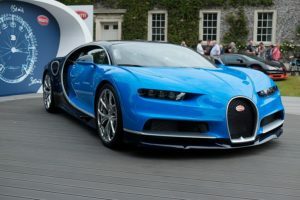 The model car is equipped with real Bugatti Chiron wheels and tires, and there is even a small steel frame reinforcing some parts. But, Lego said, more than 90 percent of the car is Lego pieces. It takes 20 people six months to put together 1,800 parts to make up the real Bugatti Chiron. The Lego Chiron took around the same amount of time to build but it was built of over 1 million Lego Technic pieces.